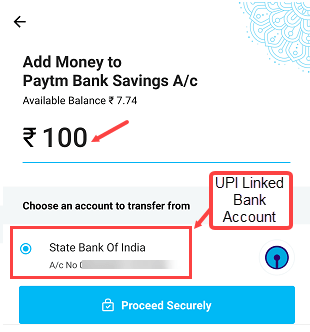 Paytm Payments Bank Account users can add money to Paytm bank account through UPI, from another bank account, using Debit card and transfer directly from the wallet. Paytm Payments Bank users can add maximum 1 lac in his/her saving account. 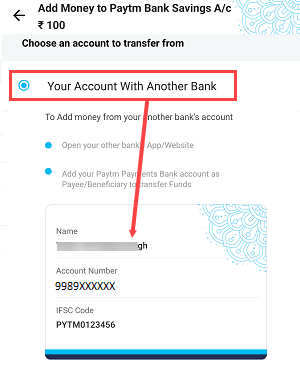 If you are Paytm Bank account customer then here are 4 ways to add money to Paytm bank account. Follow these 4 methods and add money to your Paytm saving bank account. Paytm now support BHIM UPI for Bank to Bank transfer. You just need to link your Bank account with Paytm BHIM UPI. 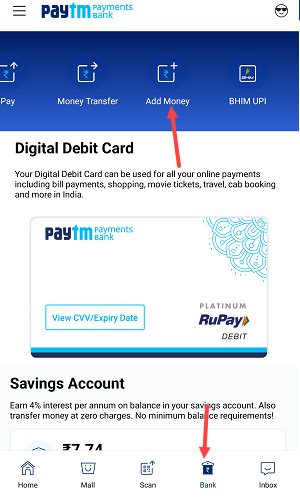 You can easily add money using BHIM UPI if your bank account linked with paytm UPI. 1- Tap on Bank and open your Paytm Bank section. Here tap on Add money. 2- Now enter the amount and select Bank account which linked with BHIM UPI & tap on Proceed. 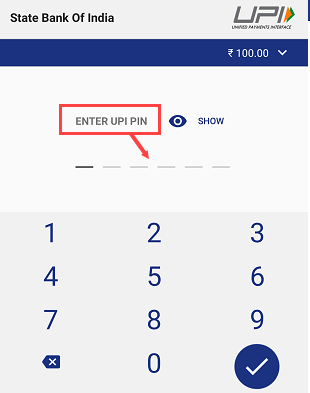 3- Now enter UPI PIN and confirm your transaction. Done! Money added to your Paytm Bank account from your linked bank account. If you have another Bank Debit card then you can use this card to add money in your paytm bank account. 1- Tap on Add money in Bank section. 2- Now enter the amount and select Debit card option. Enter your card details and proceed. 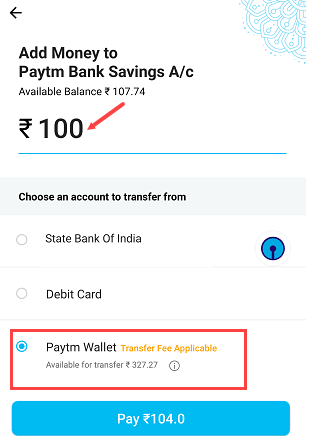 If you have some money in your paytm wallet then you can transfer this money to your Paytm bank account. 1- Tap on Add money and enter the amount. Select Paytm Wallet option and proceed. 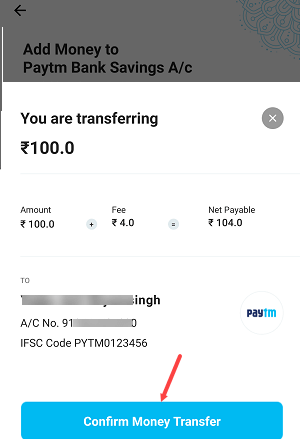 Paytm deduct some charges when you add money from your wallet. You can also send money to Paytm Bank account from your other Bank account. 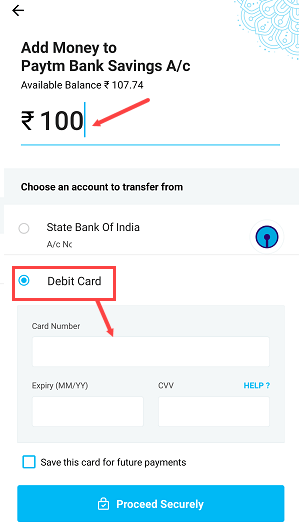 After adding Paytm Bank account, now you can transfer money from your other bank account to paytm bank account using IMPS or NEFT. So by following these 4 methods, Paytm Bank account users can add money to his/her Paytm Bank saving account. Currently paytm not accepting new account open request, you need to wait. 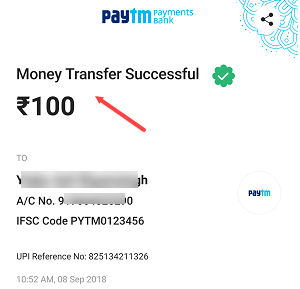 1, can I receive money from other paytm users? 2, how much is per transaction limit? 3, how much money i can receive per month? 4, how much money I can keep in my Paytm wallet? If KYC complete then you can receive money from other paytm users, transaction limit is 10,000 per month. You can keep 1 lac amount after KYC. How much money can I receive per month in my wallet? 1 lakh total? The sender with full kyc can wend up to 1 lac per month. So if your wallet and sender wallet both have full kyc then you can receive up to 1 lac per month. Please add user as beneficiary to send more money. Go to settings and select add beneficiary. Thank you , if i add beneficiary how much money i can receive ?